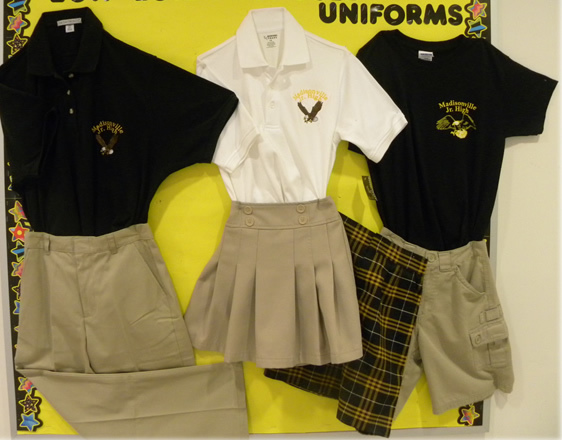 Parents and students are to refer to the Parish Handbook for all dress code policies. The principal maintains the right to determine extremes in styles of dress and grooming and what is appropriate and suitable for school. Students who have problems conforming to the dress code will either have appropriate clothes brought from home or change into appropriate clothing found here at school and may receive disciplinary action. Walking Shorts, skirts, & skorts may be either school approved plaid or khaki. All shall not be shorter than 5” above the knee. Pants/Capris: Tan khaki colored cotton twill must be secured at the waist with no undergarments revealed. All black or all white leggings can be worn under skirts, skorts. Shirts: White or black polo style shirts with the school approved logo or no logo at all. No skin may show between the pants/skirt and shirt in any position. Black uniform t-shirts are available for purchase through the school office. Sweatshirt/sweater/outerwear: Outerwear may be worn as long as they are solid black, solid white, or solid gray and worn over an approved uniform top. No large emblems or logos will be allowed except the optional school logo. MJH approved sweatshirt may be purchased. Shoes: Students may not wear beach sandals, athletic slides, or “flip flop” type sandals at school. Hats: All caps, hats, and bandannas are banned from school campus. Grooming: Facial (including tongue) piercing is prohibited. Hair must be clean, out of the eyes and not unusually colored or styled. Drawing/writing on one’s exposed skin or clothing is prohibited. Wal Mart, K Mart, Target, JC Penney, etc.